What happens when a politician attempts to tackle food waste? Well, if you are a politician in Great Britain, you get rotten tomatoes tossed your way. In fact, when Environment minister Richard Benyon claimed that Britons were wasting about £50 GBP (or about $77 USD) a week, he kicked up quite the storm. The Telegraph, dug up a photo of Benyon handing out bread to the poor. The Daily Mail points out that when Benyon, Britain’s richest MP, tells people to stop wasting food, he is more like Marie Antoinette than a concerned environmentalist. The Mirror thought his comments seemed superficial and disconnected from the real reasons for the growing food waste problem. For a while I felt like I was reading celebrity gossip and not news about ways to approach the complex issue of solving our food waste issues. And then The Guardian publishes “Should it brie in the bin?” which attempts to look at the numbers and explain how food waste is a problem in a nation facing severe austerity. 1 in 4 Americans need government food or nutrition assistance program. 68% of food-insecure families have at least one adult working full-time. About 30-40 percent of what travels from farm on the way to the fork becomes food waste. That is over 65 billion pounds of food a year according to the EPA. And finally, there were two articles with nice tips and strategies for helping individuals reduce the amount of food they waste. First, “Having a meal plan— and sticking to it — can cut waste and your waist” in the Calgary Herald makes the case for more discipline in shopping and cooking. Second, Care2.com recommends a FIFO (First In, First Out) approach to food in your fridge. 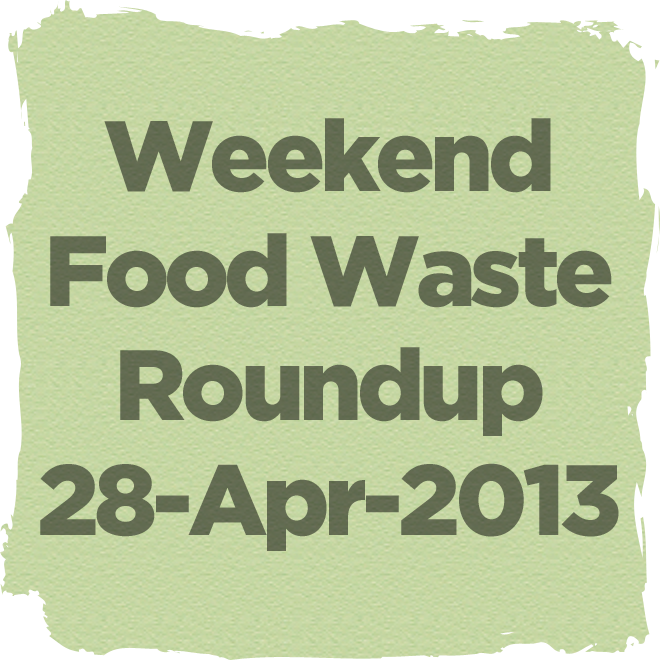 This entry was posted in Weekend reading and tagged food waste, news, On food waste, reading, round-up, roundup, sustainable living, trash, wasted food by Bonnie Lee. Bookmark the permalink. It really is a crime what is wasted daily. More people need to all this to the attention of the public. and do something about reducing the waste. Your blog is such a good outlet for the weekly news. Thank you. I felt oddly bad for poor Mr Benyon. He is trying to focus on the environmental issues related to food waste. He just lacks enough connection with day to day issues to truly understand that the issue is larger than “best before dates” on our milk cartons. I really appreciate the focus you are giving hunger and its many related issues such as food waste. You actually made me blush. I am so happy that you find our take on these issues useful. We are struggling to find a better path and sometimes I think we are hacking away at the jungle in vain. Thank you so much for the encouragement. Thank you for the shot of motivation. Much needed!